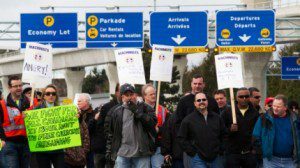 Airplane machinists are rallying at Vancouver International Airport after finding out they lost their jobs with Aveos, the company that maintains Air Canada’s fleet. They tell News1130 they are frustrated and concerned with safety standards in foreign countries. If Aveos decides to move these jobs to countries such as El Salvador and China, the machinists are concerned about safety, as those countries don’t necessarily follow the same guidelines we do in Canada. Aveos Fleet Performance Inc. got creditor protection from a Quebec superior court Monday, after laying off 1,800 workers and suddenly halting operations at their three main plants in Montreal, Winnipeg and Vancouver, as well as other facilities, including one in Mississauga.